After you finish googling a place to grab coffee for your client meeting, do you ever pause to think what people find when they google the services your company provides? Beyond a website (that, let’s be honest, may need updating), ideally your next customer also finds your executives quoted in helpful articles that answer their most pressing questions. And your google map info better be up to date, with glowing reviews from happy customers. Readying your company for online vetting is just the very first level of marketing presence required today. Keeping up with prospective and existing customers requires a multi-tiered communications approach, and a true marketing specialist can be as valuable to your company as a top-tier salesperson. Those truths were among the wake-up calls that came with a marketing assessment conducted across the broad array of AV companies represented by Professional Services Network International (PSNI). 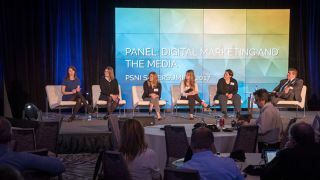 Through the process, integration firms large and small among PSNI’s 31 affiliates identified their areas of marketing expertise and those that needed improvement. The PSNI Marketing Committee is headed by one of AV’s most dynamic marketing professionals, Hailey Klein, who is also director of marketing and communications for the PSNI organization. With a central goal of aligning the marketing objectives of PSNI affiliates, the committee’s first meeting also revealed many more common threads amongst companies of varying sizes. By fine-tuning sales and marketing alignment, a company stands to gain from the knowledge obtained through marketing’s interaction with customers, and vice versa—when sales shares the demands they’re getting, marketing can tailor content to provide information that addresses needs. It seems simple, but the balance is still a work in progress for many AV integration firms as they deal with shifting sales cycles. Now the customer arrives with knowledge of the technology that’s out there, and in order for an integration company to demonstrate the value it can add to a transaction, marketing must demonstrate expertise and provide answers to intangibles in an outcome-driven world. That’s where an understanding of the new capabilities of online marketing platforms and tighter integration with CRMs comes into play. These and other informative and educational topics will be addressed by the PSNI Marketing Committee as it expands training and collaboration efforts—all with an eye toward providing value to its integrator affiliates as well as Preferred Vendor Partners (PVPs). Coming soon, PSNI will offer a new online marketing training program, the “AV Marketer,” developed by Jane Johnson, managing partner of Pivot Communications. Topics covered will include creation of a budget and marketing plan, SEO, content marketing, email marketing, outbound marketing, and beyond. Clearly there’s a lot to tackle as PSNI prepares for its next Marketing Summit this May. New programs at the event this year will be based around discussion that can further understanding of the multi-faceted aspects of successful marketing. Watch for more updates when PSNI releases plans for its next event for affiliates and PVPs.